As part of my clean-eating plan, I’ve been snacking regularly on apples. They’re a sweet and crunchy treat that’s easily transportable. Unfortunately, the most recent batch I bought wasn’t that good. The apples lacked flavor, even had a slightly odd aftertaste. In the past, I would have tossed them, wasting perfectly good food. With the recent success of my sassy cooking adventures, I decided to be daring once again and cook up something delish using the bland-but-salvageable fruit. The result was Sugar & Spice Slow-Cooker Applesauce. I was astounded by how good this applesauce was. I wanted to save some of it for my BF, who’s working out of town this week, but I couldn’t do it. It was just too yummy! The Pumpkin Pie Spice includes ginger, so the sauce’s sweetness was nicely tempered with some bite at the end. I was in gastronomic heaven, though, when I paired the applesauce with a couple of wedges of Laughing Cow Light Swiss Cheese. Yowsa! What a fantabulous combination! Mix all ingredients, except the sugar-free syrup, in 3 1/2- to 6-quart slow cooker. Cover and cook on high heat setting 2 to 2 1/2 hours or until apples begin to break up. 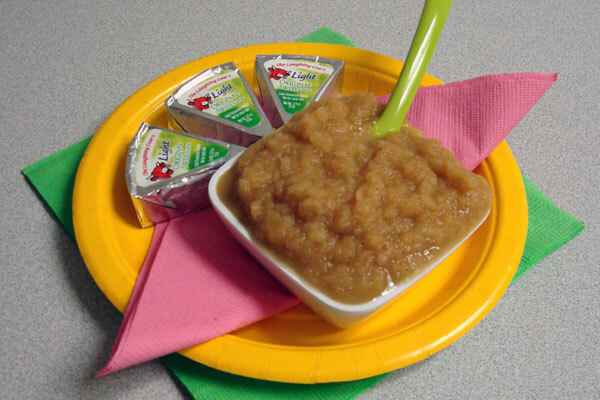 Pour apples and sauce into blender and pulse until applesauce reaches desired consistency. Add sugar-free syrup and pulse to blend. Makes 8 1/2-cup servings; approximately 136 calories, 3.75g fiber, 4g fat, and 1.25g protein per serving. Entry filed under: clean eating, food review, recipes. Tags: eating clean slow cooker meals, fruit recipes, healthier fruit dishes. This recpe sounds absolutely marvelous. I am looking forward to making it. I also like the sounds of your beef enchiladas. I am going to ty them very soon . Congrats on your weight loss. Totally awesome!! !